An engaging, well-researched account of nuclear physics 75 years ago. 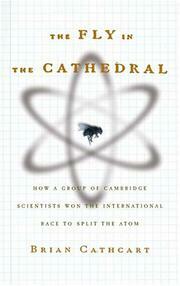 As British journalist Cathcart (Test of Greatness, not reviewed) tells us, the nucleus in an atom is like a fly in a cathedral. This 1909 revelation about atomic structure launched an international contest to dissect things further—to split the atom. The Brits won. John Cockcroft and Ernest Walton, young researchers working under the enthusiastic direction of Sir Ernest Rutherford at Cambridge’s Cavendish laboratory, built the first particle accelerator that did the job. It sent a stream of protons into a target of lithium—the lightest of all solid elements—and what the pair observed on the scintillation screen were flashes of alpha particles. By atomic arithmetic, the protons, of atomic weight 1, were hitting lithium nuclei, of weight 7, and literally splitting them into two, yielding a pair of alpha particles, each of weight 4. Cathcart details the nuts-and-bolts story of building the apparatus out of long glass cylinders connected to rectifiers, condensers, and transformers, all to build up to a charge of 800,000 volts. Inevitably, transformers would blow, gas would leak, there would be creepage, seepage, sparks, and other disasters that, however daunting, did not dash the hopes of Cockcroft and Walton, truly modest and patient fellows. Meanwhile, back in Berkeley, a young Ernest Lawrence was experimenting with a circular accelerator, a “cyclotron,” competing with other American and German teams. The early 1930s belonged to experimentalists, Cathcart notes, a point he underscores in relating the work of John Chadwick, also at the Cavendish, who discovered the neutron in 1932. But in that time of theoretical foment and confusion, due credit belongs to George Gamow, whose quantum mechanical explanation of how particles get in and out of atomic nuclei inspired the folks at the Cavendish, who deservedly would go on to win Nobel prizes. A wonderful celebration of hands-on physics back in the days before megateams presided over megabuck atom-smashers.